While the flag of the Libyan Arab Jamahiriya, the Libyan socialist state under the rule of Muammar Gaddafi, looks like it was designed by 5 year old with one crayon, it is actually full of details and historical significance. It is likely that Gaddafi chose green as a connection to his 1975 book titled The Green Book. It featured his political philosophy of a “direct democracy,” preaching certain freedoms – It was a connection to the area’s history and religion. 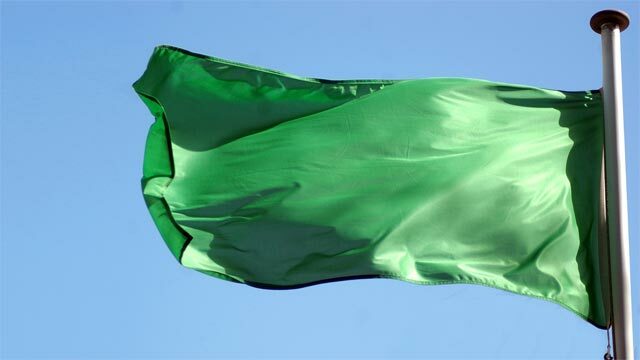 In fact, the instatement of his flag was not the only time that what is now Libya was ruled under a green flag. The Fatimid Caliphate, an Islamic ruling system led by a political and religious descendant of the Islamic profit Muhammad, also used the simple green banner from 909-1171 A.D. This caliphate once stretched from present day Algeria to Israel and included parts of Saudi Arabia and Sicily. The choice of green was likely because of its importance in Islam. Green, or “Greenness” is mentioned many times in the Quran and describes the state of the inhabitants of paradise and is often associated with Muhammad. Many flags of modern Islamic states, such as Saudi Arabia and Pakistan, feature a green field. Libya’s current flag is actually a throwback to a design from the 1950s. Libyan opposition to Gaddafi as well as several diplomatic missions abroad started using the flag in 2011, effectively replacing the all-green flag. During its time, the green flag was the only national flag to be monochromatic and not employ the use of any design or insignia.